Shawn Rocco/The News & Observer/APBlack Friday shoppers crowd a mall in Durham, North Carolina. Mention the phrase "Black Friday deals," and you'll either get people like me who'll do anything to avoid stepping foot in a store on Black Friday, or you'll see people like good friends of mine who spend days, if not weeks, planning their attack to get Black Friday deals. According to the National Retail Federation, Americans spent just over $602 billion last year during November and December. That's up to 40 percent of some retailers' annual sales. There is a misconception that Black Friday is the day to score major savings. In many cases, that is just not true. I asked consumer shopping expert Kyle James of Rather Be Shopping which items are better bought at another time -- and which deals are worth getting up for. We've all seen Black Friday ads listing some outrageous deal on a big-screen TV. Such deals are often for lower-tier sets and not the quality brands that'll last for years. Thus, they're generally not worth the money. To score a deal on a good television set, the best time to look is in mid to late January, prior to the Super Bowl, when new models are being pushed out and slightly older but still stunning TVs are discounted. According to James, "Wait until two weeks before Christmas as toys are notoriously lower in price than on Black Friday weekend." So procrastinators might save on gifts for kids. Depending on where you live, it's likely going to feel one way while shopping in November –- cold. Guess what that provides to retailers -– a captive audience. Reach into the back of your closet for winter jackets and hats. Wait until the end of winter -- and you're likely to find deals of 50 percent or more off. Power tools and hardware are commonly pitched during Black Friday, though you'll get little to no savings. James explains a better time for deals is the period leading up to Father's Day. Items like refrigerators and ovens can carry a hefty price tag, thus making us think they make for a good Black Friday deal. This is not the case. According to James, "New model refrigerators, dishwashers and ovens hit the sales floor in September and October. Because of this, you might be able to find a good deal on last year's models on Black Friday, but new models are typically not discounted very much." Fall clothing. Clearances can be a great way to save on clothing. We do this in our family and often find deals of at least 50 percent to 75 percent off. Tablets. Many bigger-name companies often have great prices over Black Friday weekend. Apple products. "Just be sure to not shop at the Apple Store," James said, "as deals at stores like Walmart (WMT) and Best Buy (BBY) will be better." It may not be exciting, and you may not have the thrill of picking up a great last-minute Christmas gift, but shopping throughout the year is going to serve you best financially speaking. By shopping throughout the year, you allow yourself to be more discerning to find the best deals possible and you can use the Black Friday/Cyber Monday weekend to help you fill in. This results in one thing for you -– more money in your pocket and less going to retailers. While others are spending late November in a frenzy, you go through it stress-free. There's no stopping the holiday creep, and this year we expect the majority of Black Friday sales to commence on Thanksgiving Day, and some of the best deals might even sell out before Friday. Since there are only 26 days (three full weekends) between Black Friday and Christmas, we expect some Black Friday sales as early as two weeks before the namesake day. While doorbusters are advertised in advance to bring shoppers in-store, over the years the competition between retailers has become so fierce that these hot deals have increasingly also made their way online. Data from previous years has shown that up to 70 percent of in-store Black Friday deals were also available online for the same price -- or less! Because Amazon (AMZN) and other sites will price-match even the hottest in-store offers from brick-and-mortar retailers like Best Buy (BBY), Target (TGT) and Walmart (WMT) many feel pressure to release deals online as well. Watch the evening news and you'll see plenty of Black Friday mobs, fights, and brawls. Fortunately, most holiday shoppers will never witness such events. Sure, there will always be reports of overly-aggressive shoppers on Black Friday, but a majority of consumers express feeling a sense of camaraderie while waiting in line predawn. Plus, no store wants instances of violence associated with their name in the news, so they will do everything in their power to keep things orderly (including beefing up their staff). Black Friday is the best time of the year to go on a shopping spree, but not every sale you encounter will merit its best-of-the-year branding. Some general categories see better prices later (like winter apparel, which will drop significantly in price come January), while there will always be average prices nestled in among those doorbuster deals. To save during Black Friday, know what you want, be flexible if you can, and don't bite if the price doesn't seem right. Everyone loves a secret sale, so on Thanksgiving Day retailers will release additional Black Friday deals that weren't in their earlier circulars. Moreover, some retailers will respond to competitor pricing and make last-minute price cuts to compete. Once upon a time, Black Friday ad leaks were actual scans of ads that were questionably posted online for shoppers to analyze in advance of the big day. Now, stores wield their ads strategically, releasing sneak peeks for rewards members or previewing the ads for select media, all to control the flow of information to their greatest benefit. Black Friday is a blockbuster event for low-end goods from stores and manufacturers you may not be familiar with. However, in recent years several retailers of high-end clothing and other items have broken the age-old trend of skipping Black Friday promotions. But rather than offer promotions from their main brands, luxury retailers have let their outlets do the dirty work. Stores like Last Call by Neiman Marcus, Barney's Warehouse, and Saks Fifth Avenue Off 5th are a few outlets you can expect to participate in Black Friday sales. Stores tend to tighten their return policies during the holidays, making it hard for consumers to return items. Some retailers will go so far as only offering store credit on returns, even if you have a receipt. A handful of stores are also tracking serial returners and banning them. And if you don't remember to ask for a gift receipt, your recipients might be doubly unhappy: they'll likely receive a store credit for only a portion of the purchase price. Black Friday may get all the attention, but last year Cyber Monday managed to trump Black Friday in terms volume of Editors' Choice deals, which is our designation for the best sales of the year with price lows never before seen. And it was precisely those types of deals that flooded our homepage last Cyber Monday. Cyber Monday is no longer a holiday that shoppers can afford to skip. While a number of online retailers advertise week-long Cyber Monday sales, the best deals appear on Sunday and Monday only, with some holding over to Tuesday. Just as we saw with Black Friday, many of the best Cyber Monday deals have crept into the preceding day, in this case Sunday. Last year, for instance, we posted four times more Editors' Choice deals on Sunday and Cyber Monday combined than we did for the remainder of Cyber Week. Unfortunately, submitting an online order -- even after entering payment information -- doesn't guarantee that the items you purchased will be yours. 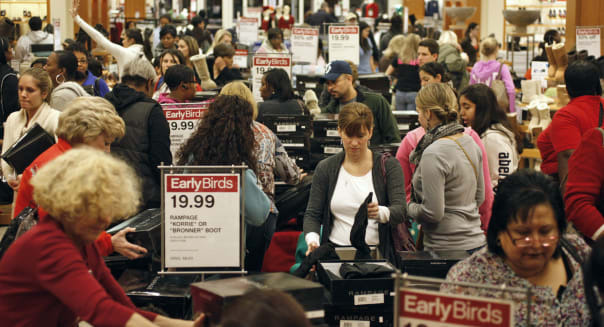 Retailers occasionally display inaccurate inventory and will sometimes let consumers buy an item that is out of stock; this is a particular problem on Black Friday, given the speed of transactions. Moreover, a store may decide to cancel all orders for items at mistakenly low prices. Best Buy notoriously did this in 2011 when it mistakenly offered a $100 iTunes gift card for $60; the store then canceled all orders and asked customers to instead purchase the deal for the intended price of $80. Unfortunately, the only guaranteed way to safeguard your personal information this holiday season is by paying with cash. However, we understand not everyone can reasonably do this. So the best way to avoid data hacks this holiday season is by taking multiple precautionary measures when shopping online. Pay with credit rather than debit, update your passwords and watch billing statements to ensure your card hasn't been used by thieves elsewhere. Should a security breach occur, immediately contact your bank and report your losses. Bargain bin devices have a reputation for being bottom-of-the-barrel items that nobody wants, be it movies, laptops or apparel. However, this past year budget products have been showing more flair than usual. That's because some of these items, such as entry-level 42-inch HDTVs and ultra-cheap laptops, simply cannot get any cheaper. So to make them more appealing, retailers have given them more panache. For laptops, that means you'll find budget machines with better-than-average specs. In the case of TVs, it means finding budget 42-inch sets from name-brand manufacturers, instead of just off-brand models. Ultimately, it's a win for shoppers because you get more value for your dollar.